This tool is brand new from Milwaukee but performs like one of their long-time favorites. One-handed band saw power and cordless to boot! The effectiveness of Milwaukee’s hand-held band saw lineup made the creation of a cordless version a no brainer. Between their tool-designing expertise and in-house rechargeable battery technology the Milwaukee M12™ Cordless Sub-Compact Band Saw Kit comes to the market with a load of useful features that will interest a wide range of users. The real-world street price will do nothing but expand the potential user market. The Milwaukee 2429-21XC M12™ Sub-Compact Band Saw weighs only 6-3/4-lbs and is just 12”-long but makes life much easier for lots of DIY and professional users. 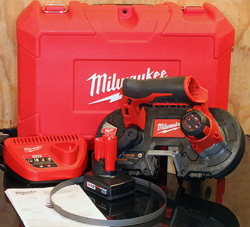 Everyone from electricians and general maintenance technicians to the average homeowner will appreciate the one-handed use and portability of the Milwaukee M12™ Cordless Sub-Compact Band Saw Kit nearly as much as its ability to slice relatively small-diameter metal (and plastic) tubing quickly and accurately. The ease of use is enhanced by a comfortable grip area and a remarkable balance that allows you to use this tool one handed! Add the variable speed trigger and an LED work light that illuminates the area around the blade and there is no excuse for making inaccurate cuts. The grip area (left) is comfortable and gives this tool near perfect balance. The battery gauge (arrow) lets you know how the pack is doing whenever the trigger is pulled. The 30-minute charger (right) and one 12V battery pack come with the kit but served all of my needs during the evaluation. The M12™ REDLITHIUM™ XC High Capacity battery gives this tool the ability to cut ¾” conduit in just 3 seconds and then lets you repeat that cut around 149 more times before recharging! The included 30-minute charger uses simple lights and a graphical explanation on its face to keep you apprised of the charging progress. The M12™ Cordless Sub-Compact Band Saw Kit has an overall cut capability of 1-5/8” by 1-5/8” which handles a huge array of jobs in both the pro job site and DIY worlds. To keep you safe the Milwaukee M12™ Cordless Sub-Compact Band Saw Kit has a dual-latching, flip-open lower guard that encloses the blade fully except in the actual cutting area to comply with OSHA guarding requirements. Swing this cover open and you have full access to the blade for changing. 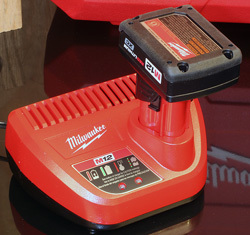 And, the Milwaukee M12™ Cordless Sub-Compact Band Saw is covered by Milwaukee’s® 5-year warranty! The Milwaukee M12™ Cordless Sub-Compact Band Saw Kit 2429-21XC reviewed here comes with the 2429-20 M12 Sub-Compact Band Saw itself, one M12™ REDLITHIUM™ XC High Capacity battery, a 30-minute charger, one 18 TPI metal cutting blade, instruction manuals and a hard carrying case. 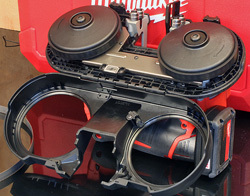 Using the Milwaukee M12™ Cordless Sub-Compact Band Saw Kit is deceptively easy. When you cut steel its mass doesn’t seem large enough for what it is doing. Despite that optical illusion there is plenty of power and control. Just how they pack all that energy in the small-sized battery pack is beyond me but they do and it keeps on working well past when I expected it to give up. Throughout the evaluation the included battery pack recharged in a bit under the listed 30 minutes. The flip-open bottom cover (left) keeps you safe during operation but gives full access for changing blades. The full set of roller bearing blade guides (right) help make this tool very accurate and easy to use. The layout of the M12™ Cordless Sub-Compact Band Saw Kit results in a balance that makes it surprisingly easy to use with one hand. The grip area is comfortable yet provides plenty of control to cut where you need it. To help guarantee that accuracy they included an LED headlight that illuminates the blade area when the trigger is squeezed. The LED stays on for several seconds after the trigger is released so you can line up for the next cut. 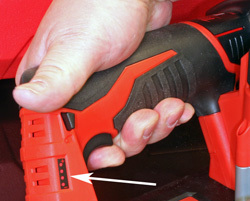 This kind of detail in Milwaukee tools gives me the impression that they are designed by people who actually use them. The trigger is truly variable speed and lets you apply as much of the available 280 SFPM (surface feet per minute) that you need for the job. Just ahead of the trigger is a cross-slider switch that looks like a reversing button on drills but on the Milwaukee M12™ Cordless Sub-Compact Band Saw Kit it is a lockout to prevent the motor from running during transport. A row of LEDs just ahead of the trigger light up during use to show the level of battery power remaining. A single lever controls blade tension and makes changing the 27”-long blades easy. The swing open cover protects you from the blade during use but gives plenty of access for changing it out. 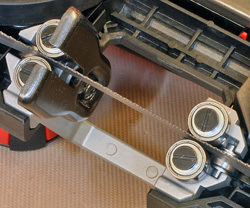 There also is a simple screw-type blade tracking adjustment. Simple but effective. The blade is controlled at the cutting area by a full complement of roller bearing guides. A tough steel fence lets you apply the power of the Milwaukee M12™ Cordless Sub-Compact Band Saw without fighting it. Set the blade on your cut mark, the fence against the steel and pull the trigger. Wait a few seconds and the cut is done. Using the M12™ Cordless Sub-Compact Band Saw Kit is as easy as it can get. The layout and design make this a very easy tool to use that is just as easy on the muscles because of its lightweight and thoughtful design. The constant speed of the blade is more than aggressive enough so you don’t have to lean on this tool to get the work done. The Milwaukee M12™ Cordless Sub-Compact Band Saw Kit 2429-21XC has a street price of just $199.00 (4-3-2012) which puts it within reach of contracting professionals as well as the avid DIY “sort of pro” user. The capabilities of this tool will make you very glad that you have it more often than you think. Anything that helps you get the work done right the first time is worth real money and the Milwaukee M12™ Cordless Sub-Compact Band Saw Kit is trough on everything but the budget.